I forget where I bought the book, but I was intrigued by both the title and by the author's unusual name, so after an engaging and encouraging dip into the pages I went ahead and bought it. That was probably a year or two ago. I really enjoyed this book - I mean really enjoyed it. For me there was refreshment on every page, I knew right away that the author sees Jesus much as I do. Bruxy Cavey understands that Jesus came to release us, not to bind us up with a thousand more dos and don'ts. Recently I decided to give the book to a visiting friend. It encapsulates what he thinks too and if it refreshed me I think it will also refresh him. Here's a little extract to whet your appetite for more. It comes from the introduction which is entitled 'The Holy Hand Grenade'. I am convinced that the Bible holds clues to a way out of our slavish addiction to religious systems, while it simultaneously invites us into a direct connection with the Divine. But isn't the Bible a book full of rules, regulations, rituals, and routines - the very stuff of religion? True, the many texts of the Bible, especially those of the Old Testament (that part written before Jesus), do contain laws and rituals, systems and institutions. 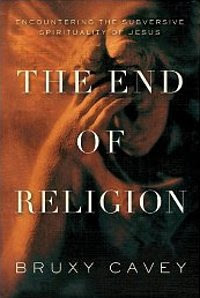 But these religious ideas are not its starting point or its ending point. The Bible begins by painting a picture of the ideal world - a world without religion, a garden where God and people live in naked intimacy. This was God's original intention for humankind. In the Bible it is only after people turn away from his ideal of mutual trust and intimacy that God gives them rules and routines, traditions and teachings - but this is not the end of the story. Religious people often tend to confuse the treasure map for the treasure. If you want to buy the book you can get it from Amazon. But if you live anywhere near St Neots in Cambridgeshire I urge you to visit Cornerstone, have a coffee and a delicious bite to eat, and pick it up or order it while you're there. David Spanberger and I visited River Church this morning for their morning meeting. Yahshua breathes his Spirit into the lives of his followers. Sometimes this results in pictures, sometimes thoughts or ideas, sometimes actions that help those around. Today for me it took the form of words. While we were singing, this is what I was given. Can you contain the presence of the Most High? 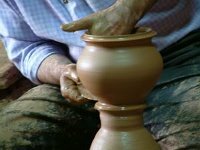 Can a clay jar hold a hoard of gold? Yes! It can! Out of your mouth will come my voice. Out of your hands will come my gifts. Out of your eyes will shine my smile. Out of your heart will beat my heart. For I AM the One who lives. You no longer live but I live in you through my Son. I feel these words are for the people at River Church, but they are also for all believers everywhere. After the singing, Rob McFarlane read Luke 17:11-19. He mentioned 1 Thessalonians 5:18 where we read that in everything we are to give thanks. We are to have 'an attitude of gratitude'. Rob then spoke on the passage from Luke, explaining that the grateful attitude of the Samaritan leper is an example of the heart attitude we, too, should have. And it seemed significant to me that one of the ten lepers was a Samaritan. This man would have seen very little point in presenting himself to the priests because he put no store in the sacrifice they would offer (Samaritans did not worship in the Temple at Jerusalem). But at first he was obedient and tagged along with the others although it didn't mean very much to him. But the moment he realised he was healed he came straight back to the one he knew to be a priest of the Most High - Yahshua. He is indeed the Great High Priest who would offer himself as a sacrifice for Jew and non-Jew alike. Coming to Yahshua as he did was effectively a prophetic act. He was saying, 'Look, this is the true Priest for he has made me whole! He was more perceptive than the Jewish lepers who simply followed the instruction they had been given according to the light of the Law. They went to see the priests of the old covenant. In contrast, this man returned immediately to the High Priest of the new covenant. How awesome is that! There are two great differences between the Jewish lepers and the Samaritan leper. The Jewish lepers didn't show the same level of gratitude, but more fundamentally they failed to recognise their healer for who he was. They saw him only as a rabbi ('Yahshua, teacher') and not as King and High Priest. And this King and High Priest is the One that we contain, jars of clay though we are. What an incomparable salvation we have in him, Yahshua the Messiah, living Son of the Most High! I've been reading the Bible regularly or irregularly for about forty years now, and early in that process I discovered that it was useful to have a plan to follow. Having a plan makes sure that everything gets covered, and it can be used in conjunction with just dipping into favourite books and passages when I feel like it. There are many published Bible-reading plans and aids but none of them seemed quite right for me. So in my late twenties or early thirties I devised one of my own and I've followed it ever since. I offer it here for you to use, adapt, or ignore as you will. But even if you don't decide to use it perhaps it will encourage you to adopt another reading plan, modify your current one, or devise one of your own. You can find a full list of the books in the Bible and the Apocrypha on the Bible Gateway website. If you've read this far you will probably want to know how my plan works. So here it is. An explanation follows. Reading this way 50% of my reading is New Testament, 25% is Old Testament (minus the Psalms), 12.5% is Psalms, and 12.5% is Apocrypha. However, there are more verses in the Apocrypha than in Psalms, so I cover the Psalms more often than the Apocrypha. This balance suits me quite well. The information at the bottom of the columns shows the exact number of chapters and the time it will take for the entire column reading one or two chapters daily. For example, if you read one chapter from column one every day it will take you nearly thirteen and a half months for the entire column, just over a year. At a rate of two chapters per day the column will take less than seven months. To change the balance you can simply change the sequence of columns or the number of chapters you read each day. If you miss a few days or want to read more each day you will cover the pattern slower or faster. Let's take a look at what's in each column and why. This contains the Pentateuch (the first five books of the Old Testament) and the historical books. In other words it includes all the books from Genesis to 2 Chronicles. This column covers creation, the Law, and the history of Israel until they were taken into captivity by the Babylonians. Here you will find all the Old Testament prophetic, wisdom and poetic books (except Psalms), mostly written after the return from Babylon. There are notable exceptions - Job, for example, is a very much earlier book. Ezra and Esther are in brackets because the same chapters (and more) are included in column four. You can choose to read Ezra and Esther in both columns, or leave them out of either column two or column four. Between them, columns one and two will take you through the entire Old Testament. If you read a chapter a day from each column you'll cover the Old Testament in just over a year. Unlike the Old Testament columns, I have rearranged the order of the books in column three. They are presented in four blocks with a similar number of chapters in each. There are several reasons for doing this. The four gospels are separated so you don't read them one after another. This means you will dip into a gospel book more frequently. It also makes it possible to read Acts immediately after Luke's gospel, and as Luke wrote the two books as a consistent account to be read in sequence this seems a useful thing to do. Arranging the books this way also brings John's gospel close to his letters and to Revelation. If you don't want to read the Apocrypha just leave this column out of your reading pattern and include the bracketed book of Esther in column two. But I think there are good reasons to cover the apochryphal books now and again. For one thing the books of Maccabees cover some of Israel's history between the Old and New Testaments and this is interesting in its own right. There is no agreed order for the additional material in the Apocrypha, the Roman Catholic version is differently structured than the Anglican version, not only in terms of the books but even in terms of chapters and verses. Psalm 151 would often be included here too, but I've added it to column five instead. Good old Psalms! I've put them in a column of their own so that they are not read as a solid block but are interspersed in your reading. If you want to read through Psalms faster, put the column into your reading pattern more than once. Reading according to my choice of column pattern (1, 3, 2, 3, 4, 3, 5, 3) I began as follows. Genesis 1, Luke 1, Ezra 1, Luke 2, 1 Esdras 1, Luke 3, Psalm 1, Luke 4 (then following the pattern again) Genesis 2, Luke 5, Ezra 2, Luke 6 and so on. So you can see how the pattern works out. You can read just one chapter a day (or even less than a chapter) or you can read several chapters. You can break the pattern whenever you wish and come back to it. You might, for example, want to read right through a single book or part of a book for a Bible study. Simply make a note of where you are in the pattern and come back to it later. RESPONSE - What inspires me? My answer really centres on the idea of listening to Yahshua daily or, more accurately, moment by precious moment. I live each moment once, just briefly. And in each of those moments I respond to influences and pressures, to joys and fears, certainties and doubts. Some things I desire, other things repel me. And everything is in relationship to others. Even when I seem to be alone Christ is with me. Every little thing I do or say affects those around me. But through it all I try to pay attention to the voice of Jesus guiding me. He speaks to us by living within us (Christ IN you, the hope of glory). We are containers for his life, his power, his righteousness, he is the bread of life, the living water, in him we can do ALL things. But we must listen. So for me inspiration is a matter of listening, hearing, and obeying. Let's look at this in a slightly different way. To be inspired is to be breathed into. If I retain what is within me (stop breathing) I will die! It's no coincidence that the word 'expire' implies death. A body that is not breathing is dead, or about to die, or about to start breathing again. Breathe and live, don't breathe and die - there are no other alternatives. There is physical breathing and there is spiritual breathing, physical life and spiritual life, physical death and spiritual death. When I first recognised Jesus as the Messiah and believed that he was the Son of the Most High, he breathed his Spirit into me and I became spiritually alive with his life. The word 'spirit' and the word 'inspire' are closely related - both have to do with breath and breathing. 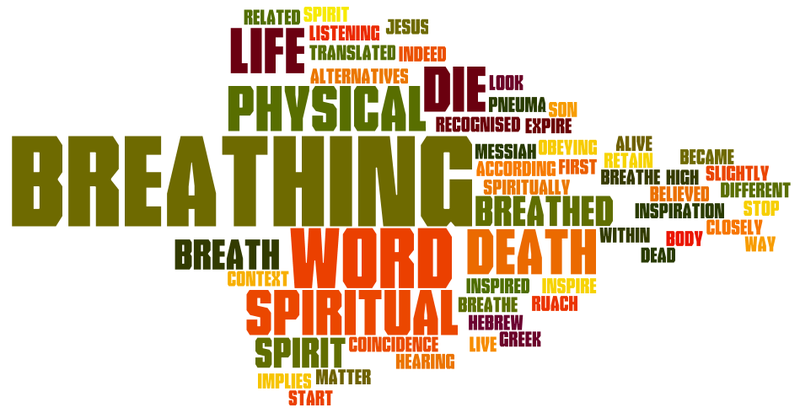 Indeed, the Greek word 'pneuma' and the Hebrew 'ruach' can be translated 'spirit' or 'breath' according to context. The Holy Spirit is the Holy Breath! When I was born my lungs inflated with air and I have been breathing ever since. If I stop I will die. When I was born again I was filled with spiritual breath (the Holy Spirit) and I have been breathing him ever since. If I stop I will die spiritually. Do you think about breathing? Perhaps you are aware of breathing when you've been doing physical work and you are 'out of breath'. But most of the time it's a natural rhythm and you don't have to plan to breathe or set aside a special time for it. You even manage to breathe every night while you are asleep. Breathing is automatic. Spiritual breathing is the same, it needs to be automatic. It is what 'inspires' us. The Holy Spirit was sent to lead us into all the Truth (Yahshua is Truth), to comfort us, to guide us, to be our advocate, to act in us on Christ's behalf. I am inspired when I see Jesus in others, when I see the evidence of his life in them. I'm inspired by every action or word that comes from the fruit of the Spirit in others, such things as love, joy, peace, patience, kindness, goodness, faithfulness, gentleness, and self-control (Gal 5:22-25). I'm inspired by beauty, grace, humility, wisdom, and everything that is good (Phil 4:8). Inspiration comes from the Father through the Son as a result of their Spirit living inside us. And that inspiration floods out into every part of the body (the church), just as the air I breathe gives life to my fingers and toes and every organ in my body. You have been called to be inspired and also to inspire. That is calling enough for a lifetime of fulfilling work. Jesus' followers are being persecuted in many countries around the world. I have seen a number of websites providing information and comment, but one of the best must surely be Release International. The organisation was set up by Richard Wurmbrand who himself suffered persecution in Communist Romania in the 1950s and 60s. He wrote many books and clearly understood the need for an international organisation to support the oppressed and persecuted. For examples of the articles available, take a look at the current news page. Here's a mixed bag of recent updates from around and about. They're all well worth a look. House2House Newsletter - Financing the infrastructure - Tony and Felicity Dale discuss the financial support of mission. This is such an important topic, itinerant workers cannot always support themselves and will need some form of help. The article is rich with links to other relevant sources on line. Harvest Now - Why we do what we do - Steve and Marilyn Hill report from Kyrgyzstan, the scene of violent clashes recently between Kyrgyze and Uzbek people. Many have died and huge numbers been displaced during this Muslim on Muslim ethnic violence, but out of the ruins and pain something wonderful is happening. The love of Jesus, the Prince of Peace, is impacting more people than ever before. Nomad Podcast - Interview with Terry Virgo - Tim interviews the man behind New Frontiers and we hear about church and the new forms it may take. SimpleChurch.eu - Nine best simple church books - This is a fine collection of titles. I haven't read them all, but those I have are outstanding. My personal favourites are 'You see bones, I see an army' and 'An army of ordinary people'. Would that be the same army? Yes! 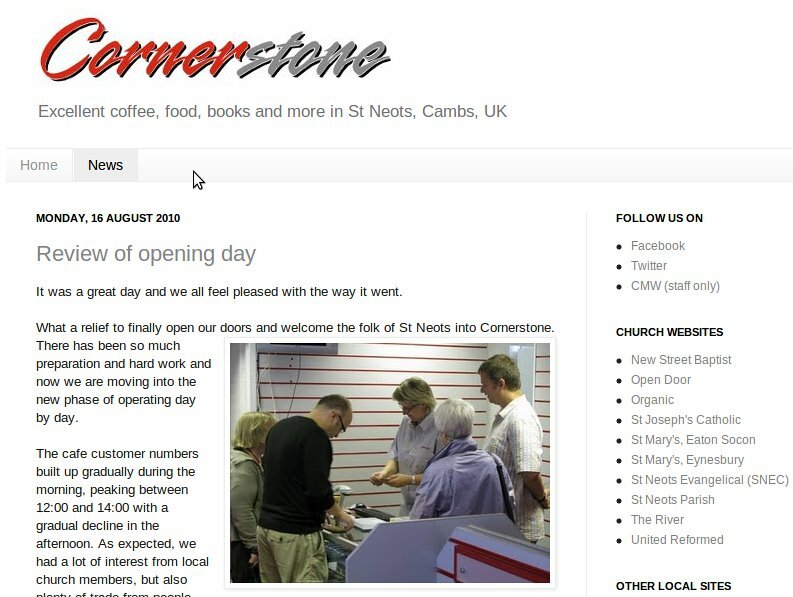 Paul Shinners, the owner and managing director of Cornerstone, has circulated a vision statement and invitation to the church in St Neots. 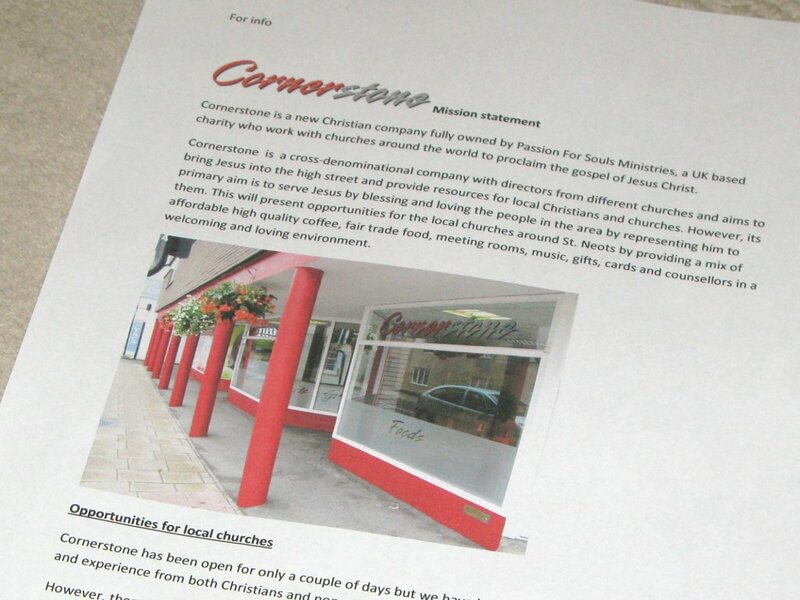 Cornerstone is a cross-denominational company with directors from different churches and aims to bring Jesus into the high street and provide resources for local Christians and churches. However, its primary aim is to serve Jesus by blessing and loving the people in the area by representing him to them. This will present opportunities for the local churches around St Neots by providing a mix of affordable high quality coffee, fair trade food, meeting rooms, music, gifts, cards and counsellors in a welcoming and loving environment. Cornerstone has been open for only a couple of days but we have had rave reviews on the quality and experience from both Christians and non-Christians alike! However, there is an opportunity for more volunteers to be part of this exciting venture and for your church to be represented in Cornerstone to help engage in outreach with the local community in a non-threatening environment. We can offer any volunteers uniforms, free lunch and drinks, and travelling expenses. I know that all of us living in the area and involved in small, organic expressions of church will find this an interesting opportunity. It fits particularly well with our own understanding of church and being actively involved with the people around us. We are here to love the Father, love one another, love our neighbour, and even to love our enemy. What better start could we have than a place like Cornerstone, designed to serve the local area with good food, good drink, good books, and good facilities for meeting? So please bring this to Jesus in prayer, ask him if he wants you involved. If you need to know more here are some suggestions. Watch the video about the making of Cornerstone. Visit the website and read about it. Come and visit for a coffee and a chat. 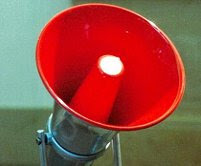 Let the staff know that you are considering becoming a volunteer and that you'd like the chance to ask some questions. Ask to see the meeting room and other facilities. Cornerstone has been keeping me very busy for the last few months. This great little cafe and bookshop has prevented me updating 'All About Jesus' for some time, and just as I was beginning to think I could move on to other things again, I seem to be in danger of getting drawn in even deeper! The Cornerstone website will give you much more information about the project itself, but I'm going to share some more personal thoughts here. My life is indeed, 'All About Jesus'. I want him to be King in my life, I want to be obedient to him in the way a loyal subject would be obedient to a mediaeval king. Kings had absolute power in those days, disobedience was not an option. Yahshua (Jesus) is always benevolent, and the reason is simple - he loves me. He simply has what is best for me in mind at all times and will lead me and command me in ways that keep me spiritually safe. That doesn't mean things will always turn out well as the world understands and judges these things. Bad things happen to us in life. But the world doesn't comprehend the truth. So I have a dilemma. I want to help and serve my friends (and it is good to do that). But my overriding priority must always be to serve King Jesus. Cornerstone is a wonderful project and it is most assuredly a project conceived and enabled by the King. He has shown me without any doubt that I was to be involved in the development of the shop. But what is he requiring of me now? It's not enough to do what seems good or necessary, instead I must do what I am told. That's why listening is so important in our lives. And what he seems to be telling me right now is that he wants me to be involved in Cornerstone in some way, but volunteering to work in the shop may not be quite what he has in mind. I am still feeling my way in this. Cornerstone certainly needs people to do the work, in fact it needs many, many people. Am I one of them? In a way, yes, but perhaps not as I might expect. To be perfectly frank, I am not yet sure! My best guess as I write is that my role will be managing websites and helping provide direction. Straying into other areas could become a kind of disobediance. I need to be careful! I am sure that over the next days and weeks it will become clear to me. It's not a matter of likes and dislikes, or of whether I am competent or not competent. It's a matter of obedience! I must wait to find out. Father, show me the right way forward. Where next with this blog? This is the first post since 23rd June. I've been busy with 101 things and have failed hopelessly in my attempts to keep things up-to-date. In particular a family holiday in North Wales and work leading to the opening of a coffee/book shop on 14th August have demanded a lot of time, and the holiday was in an area where internet access was rather problematic. All About Jesus (AAJ) - which you are reading right now. This blog is a record of meeting notes, thoughts, announcements and more. It centres on my spiritual life and those of my friends. AAJ developed from online meeting notes and goes back to 2001. The Scilla Blog - this is a series of posts about other things that interest me - science, technology, thoughts about life, things I have read, things I have noticed, photography etc. 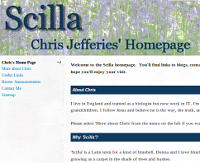 My personal 'home' page - also called 'Scilla', it has a little information about me and links to the other websites. 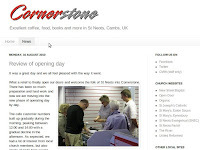 The Cornerstone website - the internet presence for the Cornerstone Cafe and Bookshop in St Neots. 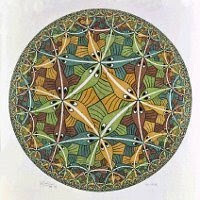 Sundry other sites - blogs, wikis, Facebook, Friendfeed, Twitter. Some of these are for personal use, others are part of my public presence on the web. What I think I might do is collapse all these down into just two main sites, AAJ (this blog) and the Cornerstone site. I will also retain some of the wikis and other sites as glue and to communicate with close friends and family. The main impact of doing so would be more frequent posts here on AAJ and on a much wider range of topics. I'll make sure to provide links to the old sites so it will be easy to read older items.